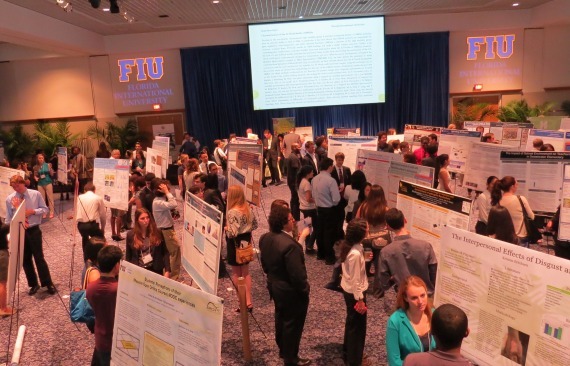 Students from across the state came to FIU to share their undergraduate research at FURC 2014. More than 500 students converged upon the Graham Center Ballrooms Feb. 21-22 for the Fourth Annual Florida Undergraduate Research Conference (FURC). This year’s event was the largest multi-disciplinary undergraduate research conference ever held in Florida as students from 26 Florida colleges and universities, both public and private, presented their work in professional poster form at the event. Hosted by the Honors College, the conference provides exceptional networking and recruitment opportunities. More than 40 graduate and professional program recruiters from U.S. and overseas universities—including the University of London, Columbia, Cornell, Emory, Ohio State, RPI and Notre Dame, among others—set up tables to talk about their graduate programs. FIU’s colleges also recruited heavily. “I was amazed at how many people found my work to be an important step towards future research,” said Sarah Terrazas. The first-year Honors College student was a presenter and volunteer. Lakshmi Reddi, dean of the University Graduate School, served as the keynote speaker at the conference banquet. He spoke about the limitless possibilities that exist for doing research, giving examples of things in the natural world that we still don’t grasp (how plants and termite mounds regulate their temperatures, etc.). He stressed the importance of taking an interdisciplinary approach to today’s research problems.